If I could push a button, add a link–something–to allow you to smell the aroma of the mushroom broth/dip/jus as it simmers, you would clear your calendar and make this immediately. 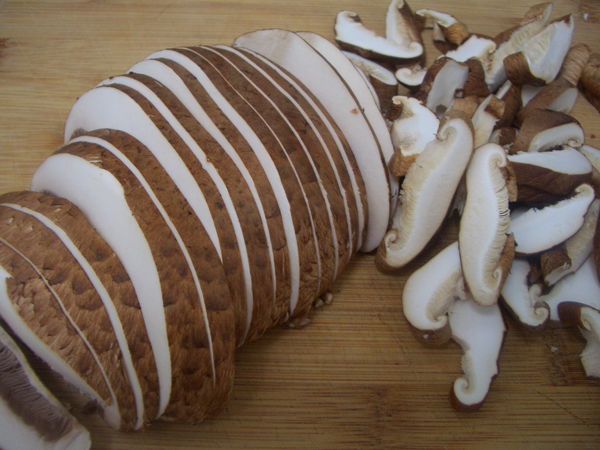 Mushrooms have a meaty quality perfectly suited to mimicking a roast beef sandwich. 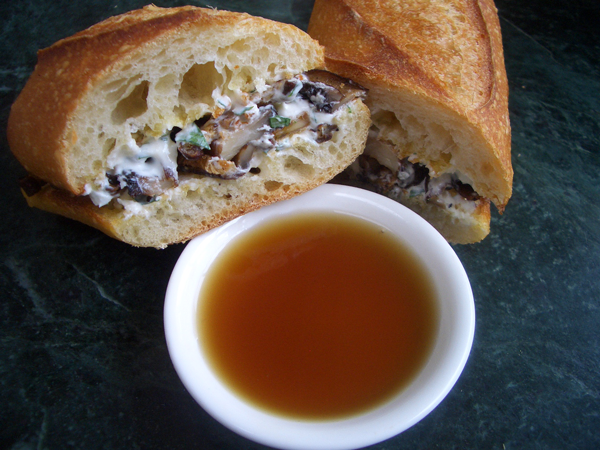 Wrapped in a chewy baguette, smothered in peppery sinus-clearing horseradish cream and dipped in a rich mushroom garlic broth–heaven on a plate. This is the most time-consuming part of the recipe. 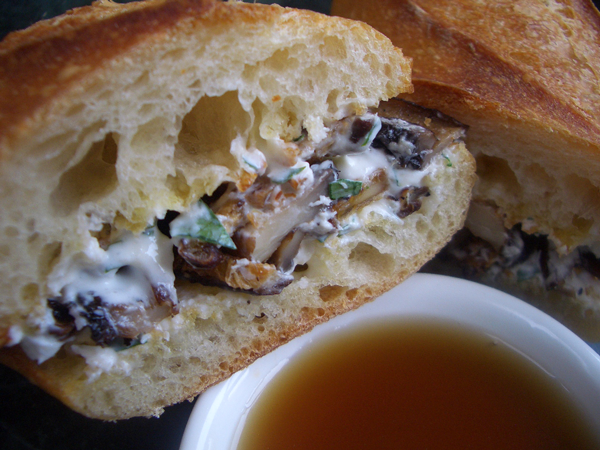 The roasted mushrooms, horseradish cream, toasted baguette–minutes away. To allow you to throw this sandwich together whenever you like, make a large batch of the jus, freeze it in ice-cube trays and thaw out small portions as needed. 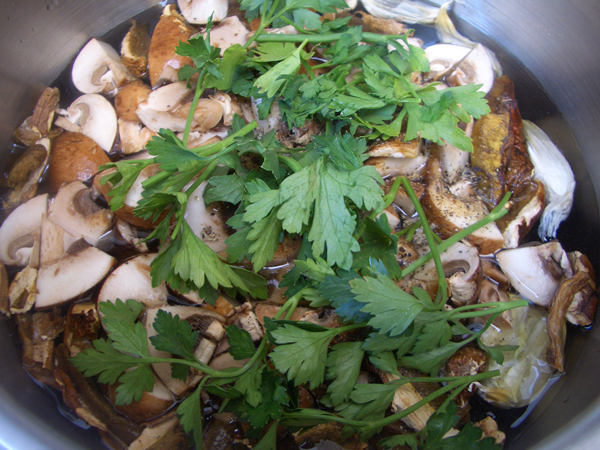 Add everything to a pot, bring to a boil, reduce to a simmer and let cook for at least one hour, more if you want to enhance the flavor. The more you cook it, the more it reduces, the stronger the flavor. You just want to leave yourself (and friends) enough for dipping. 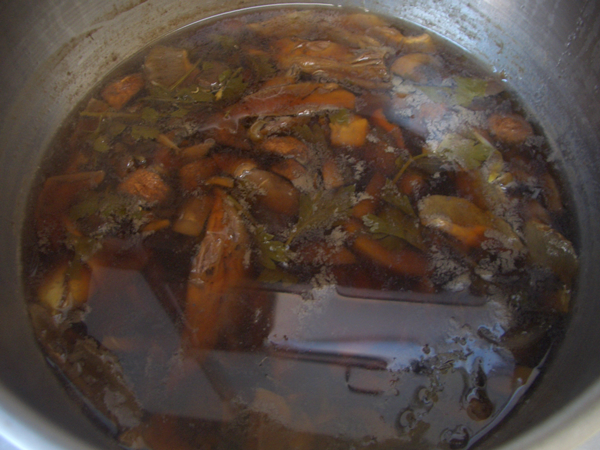 It’s a good idea to strain the finished jus through a coffee filter or paper towel to remove the sediment often accompanying dried porcini mushrooms. Set aside or freeze for later. 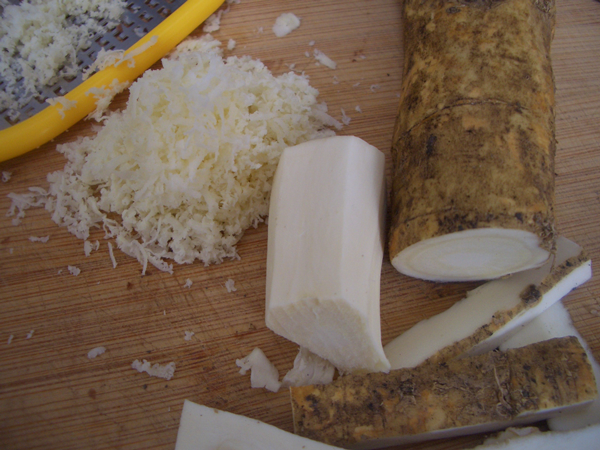 You can also use prepared horseradish instead of the fresh root, but the fresh is pretty amazing stuff. 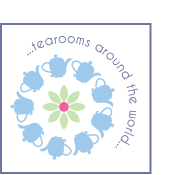 You’re likely to find it in the vegetable aisle next to the fresh herbs and root vegetables. I used shitake and portobello. The shitakes get crisp and chewy and the portobellos buttery and tender which makes for a nice contrast in texture. 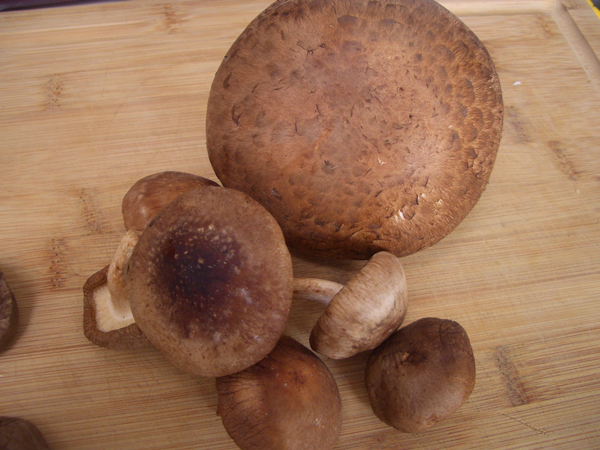 Button mushrooms, cremini, chanterelles, oyster, king trumpet are possible substitutes. 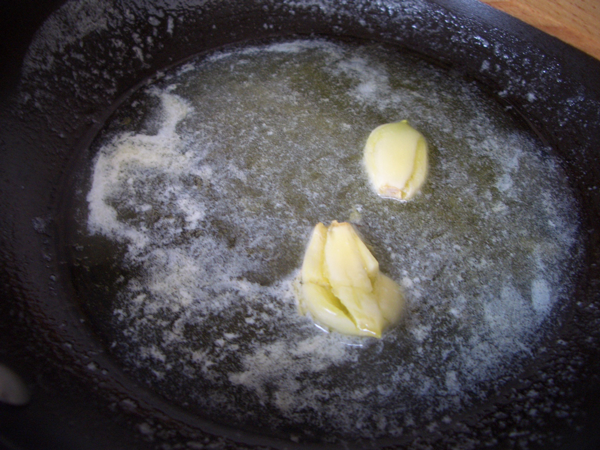 In a skillet over medium heat, melt the butter into the oil. Add the garlic and cook for about 3 minutes. Remove the garlic. 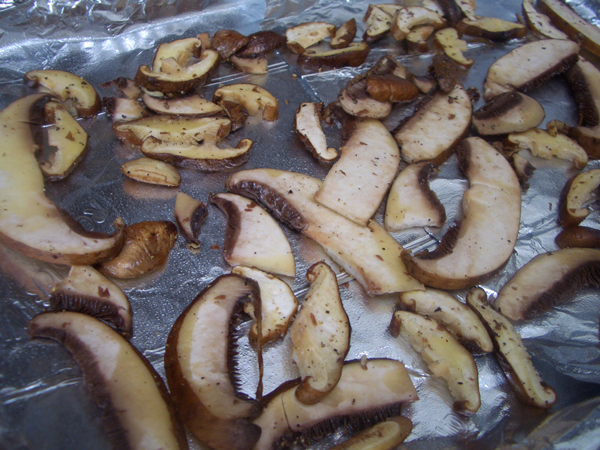 In a bowl, gently toss the sliced mushrooms with the butter/oil, a few pinches of salt and freshly ground black pepper. 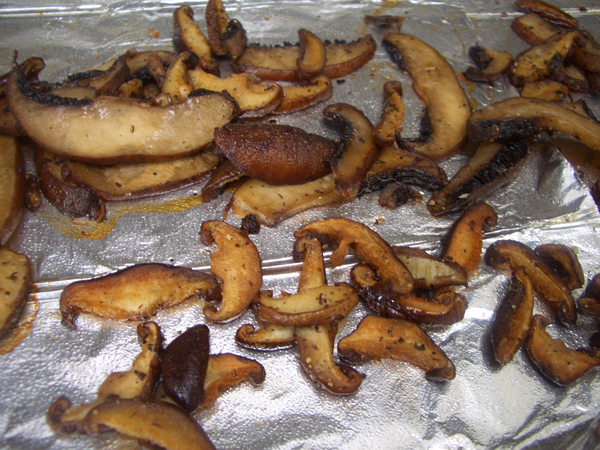 Spread the mushrooms in a single layer on a foil-lined baking sheet. Bake at 350F/175C degrees for about 15 minutes, turning the baking sheet 180 degrees halfway through to make sure they cook evenly. 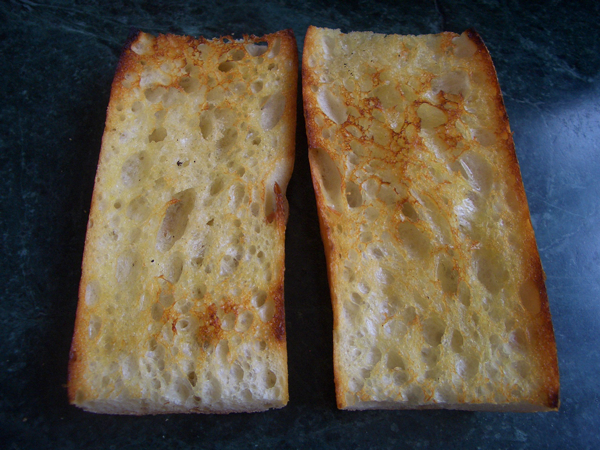 Cut and split the baguette. I made 5-inch or 13cm sandwiches. 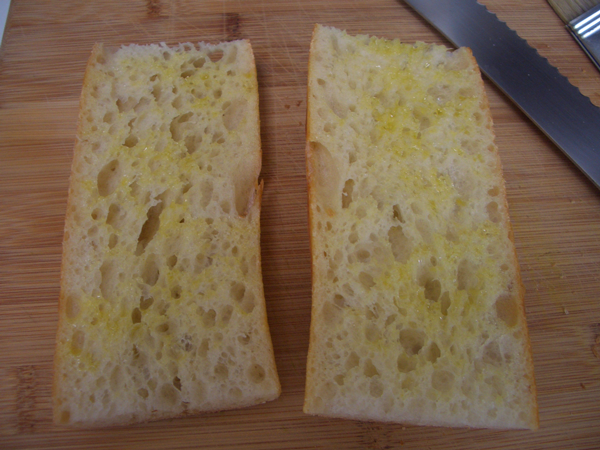 Brush the inside of the bread with a little olive oil or butter and toast, fat side down until the bread is crispy and golden brown on the inside. 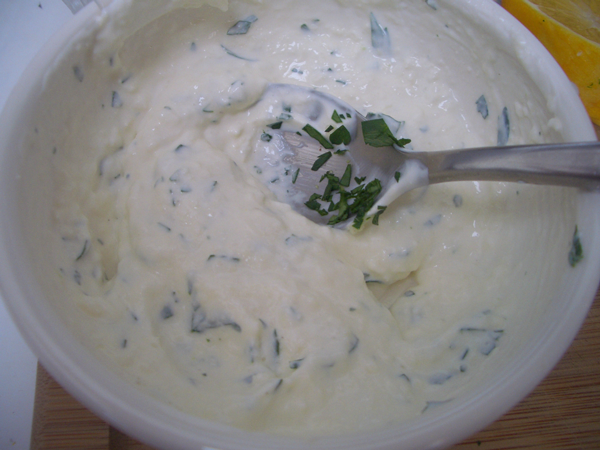 Spread each side with about 1 tablespoon (15ml) of horseradish cream. Pile the mushrooms on one half and top with the other. Using a serrated knife, cut the sandwich in two. 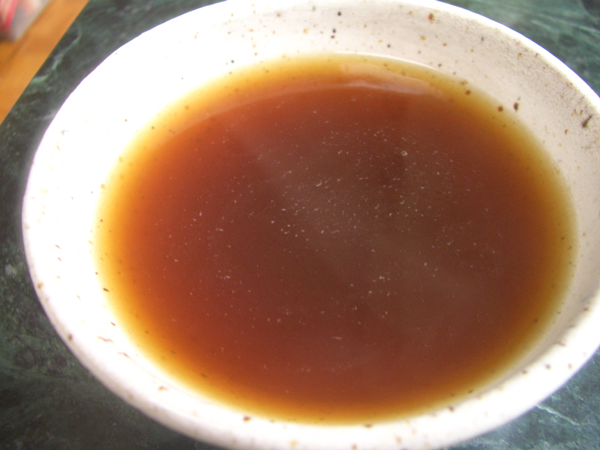 Give each person a little dish of hot jus to go with their sandwich. Make sure the bowl is big enough to allow for dipping.